Thus, wherever Guru Nanak Dev Ji went, he converted large number of people by his teachings. These people become his disciplines and called themselves Sikhs, to the day the followers of (Guru) Nanak are known ask Sikhs. At sunset Sajjan began to urge (Guru) Nanak to go to bed early. “it is getting late you look tired,” he said in a voice full of concern for his guest. Yet their hearts are evil. 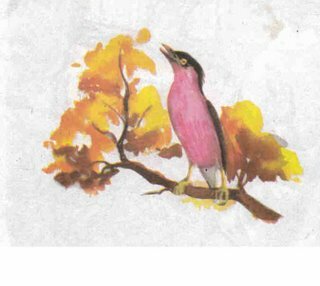 Sajjan realized that what (Guru) Nanak said about herons and hawks applied to him too. “What Nanak says it quite true,” he admitted to himself. “I might appear kind and friendly, but I am like these birds Nanak speaks of. 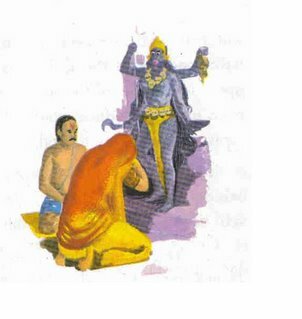 Although I do not eat people I do almost the same thing, for I kill them.” He fell down at Nanak’s feet and asked his forgiveness. “Give away all you have gained in this way to the poor.” Guru Nanak Dev Ji said. Sajjan did as (Guru) Nanak had asked and became his follower. The first Sikh temple in India was built by Sajjan the robber, in gratitude to (Guru) Nanak who had changed his way of life. (Guru) Nanak’s last journey was towards the west. He wanted to go and see the places which Muslims considered holy. So he joined a band of pilgrims on their way to Mecca. One day, during the journey, he fell asleep in the mosque. Suddenly he was shaken awake. Standing above him, glaring down at him furiously, was a Mullah, the Muslim priest of the mosque. On hearing such wisdom the Mullah fell down at Nanak’s feet in admiration and asked Nanak to forgive him. 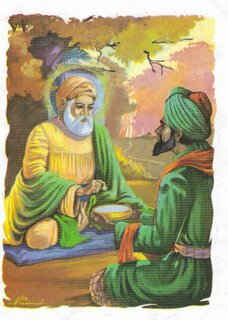 After this, (Guru) Nanak went to Mecca and from there Medina and westwards to Baghdad. Everywhere he met people who believed firmly that they were very religions and devoted to God. In this way (Guru) Nanak won the hearts of many Muslims. (Guru) Nanak returned to the Punjab after many months. He wished to end his days in the country-side he knew and loved best. So he settled down with his family at a small town named Kartarpur. One question kept troubling him, “are not all men equal? When then is the Brahmin regarded as holier than the Sweeper? Surely this division of man from man is inhuman?” (Guru) Nanak often said. So he decided to true and change the system which by building walls better men cause such bitterness. Large numbers of people began to gather to see (Guru) Nanak and hear him speak of god. (Guru) Nanak told them how they should live. He asked them to wake up three hours before sunrise, bathe in the stream and then go to the temple to recite morning prayers and sing hymns. Thereafter they were to be free to earn their livings. In the evening after having done a full day’s work, be it farming, shop-keeping or weaving, the people were asked to gather to pray and sing hymns. After this they all dined together in the temple. Before going to bed to sleep, everyone was expected to say another short prayer. This become the life of work and prayer of (Guru) Nanak’s followers all over the country. As (Guru) Nanak grew older, he began to look around for someone who could carry on the worked he had started. He did not think either of his two sons fit for the job. 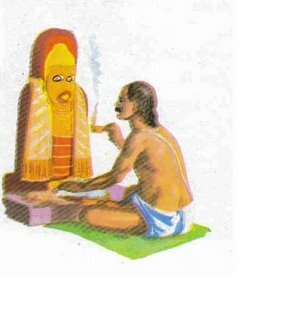 His elder son, Sri Chand, had become a hermit. He lived alone in the forest, praying and fasting. “how can a man guide people if he cuts himself away and goes and prays alone in the forest,” (Guru) Nanak always said. Nanak’s younger son, Lakshmi Das, was the exact opposite. He was only interested in making money. So who could Nanak choose as his successor? 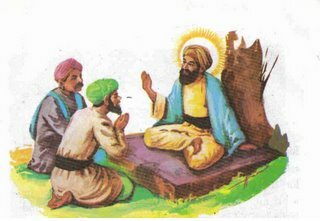 Among his followers, (Guru) Nanak was very impressed by a man named Lehna, who had repeatedly proved his great devotion to God. 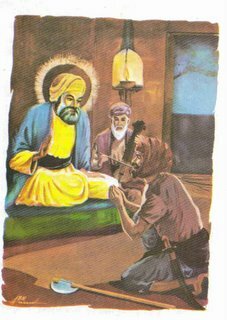 (Guru) Nanak changed Lehna’s name to Angad which means ‘of my own body’ and told him to spread his message and set an example for all. 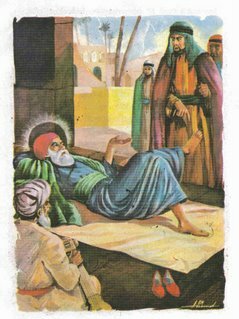 The years went swiftly by and (Guru) Nanak was now approaching 70. with old age he became frail, but his interest in the world around did not wane. The woodlands in the flower, the mustard in bloom and the calling of the Papeeha as the monsoon broke, still sent him into poetic rapture. Nor did his love for the people lessen with the years. He was never too tired to listen to their problems and was always ready to offer words of comfort and advice. 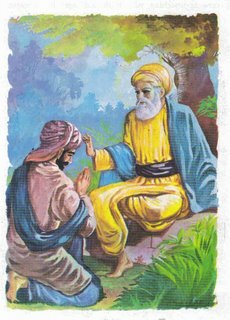 The circle of peole who respect him and followed his guidance increased daily…..
People often ask, “What did Guru Nanak Dev Ji do which was so unusual?” he himself admitted that he was not a special messenger of God and could perform no miracles except reciting the name of God. He was just a teacher like so many others. And India is full of teachers and holy men. (Guru) Nanak plucked a petal of jasmine flower and put it in the cup, where it floated on the milk and scented it. Very nice site, when ever i talkto sikh ladies I give this site ref. You are the base of the world. Mother make good society, society makes community, community makes country and country makes world. Very Nice Blog, I read some posts and find them useful. If you want to give a professional look(Even now it has very good look) to this blog,then let me know and give me a chance to do Seva.